INPEX Corporation (INPEX) is Japan's biggest oil and gas development company and is involved in all aspects of this business, from research to exploration, production, and sales. INPEX is engaged in projects all over the world, in a total of 29 countries, including Japan, where it operates a gas production plant near Oyazawa, a town in Niigata prefecture. This plant receives natural gas from the Minami Nagaoka onshore gas field and treats it using the methyldiethanol amine method to remove corrosive CO2. Each day, it sends out 1,500,000 Nm3 of purified gas to its customers via a pipeline network. As the work periods overlapped, this process took 9 months, from start to finish. Plant operators had to quickly scan many different process graphic displays and trend displays to understand what was happening throughout the plant, hampering their ability to take quick and appropriate action. The information displayed was not color coded based on priority. The layout of text, graphics, etc. was confusing and easy to misread, leading to operator errors. The overview displays lacked detailed information and were of limited use to the operators. 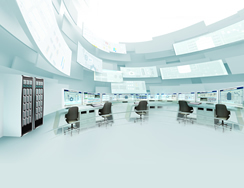 Although the operators had access to multiple monitors at their workstations, they had received no training in their use and the extra monitors were not being used. The team reviewed and analyzed how the plant's most experienced operators carry out their monitoring and control tasks, examining the purpose of each task, the data needed, the displays used, how information was used to control an operation, and how information was used to monitor operations. Based on this, the process data was ranked by level of importance and documented in a task analysis sheet. In the redesign of the displays, careful consideration was given to factors such as the relationships between information, pop-up window position, and navigation between displays. Some of the redesigned task-based graphic displays are shown below. In a display, the color of the background, text, and graphics can have a significant impact on usability. Based on interviews with this plant's most experienced operators, and in accordance with ergonomic principles, the project team employed the AOG approach to redesign the GUI color scheme and layout and make process data easier to read. This also was done with CAMS for HIS, a standard consolidated alarm management function for Yokogawa's CENTUM VP PCS that was introduced to address the issue of alarm flooding. After a reprioritization of all the system alarms, the alarm color scheme was redesigned based on priority. A KPI display provides information on every aspect of a plant's operations that its operators are responsible for, including output, quality, efficiency, and safety. They help motivate operators by showing how their work impacts plant performance. The following display shows four different types of KPIs and can be viewed on a single large screen positioned behind the double-tiered HMI screens. To make effective use of the double-tiered HMI screens and a single large screen in the control room, a four-level hierarchy was defined for the graphic displays. 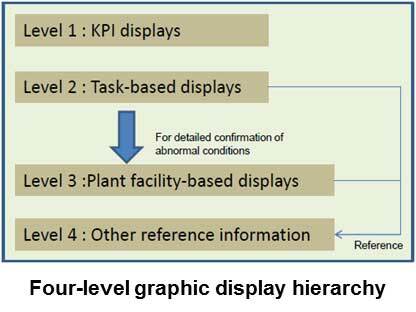 Since plant operators mainly interact with task- and plant facility-based displays (levels 2 and 3), these were mainly assigned to the lower monitor in the double-tiered HMI. Level 1 displays along with the level 2 loop-watch displays were assigned to the upper monitor in order to navigate into level 3. KPI display is presented on the single large screen to share plant performance information between all control room users. This arrangement allows operators to stay on top of what is happening throughout the plant and quickly identify any abnormal conditions. Through the AOG service, other package solutions were also proposed to help this plant achieve operational excellence. For example, to make use of a task time estimation program that INPEX developed, Yokogawa proposed the introduction of the Exapilot operation efficiency improvement package to eliminate operational mistake by manual calculation, and to reduce working time for alternative tanks usage. The operators and managers at the INPEX Oyazawa plant initially were not sure how ergonomic design and knowledge-based technology could benefit them, but came to appreciate this approach after seeing how it improved not only alarm design and procedural automation but also the overall operations at their plant. 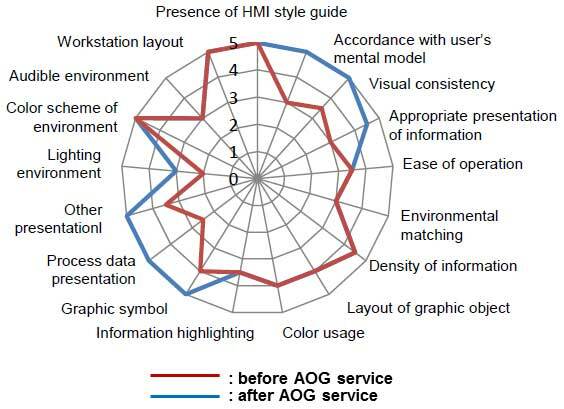 The project team created the radar chart shown on the right, and assigned scores for a range of criteria, before and after this consulting project. A PCS graphic design service provided by Yokogawa that is based on human factors engineering and knowledge engineering. AOG emphasizes ergonomic design, and seeks through improved color selection, layout, and so on to improve operators' situational awareness. Based on insights gained from experienced personnel, this ensures operators have ready access to all the information they need to make effective decisions.